War! The Galaxy is in turmoil. Once peaceful planetary systems now become the front lines of an epic war that is redefining the history of the Republic. More and more systems slip from Republic control. 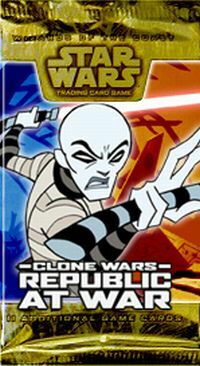 Trained in the art of war, the Republic’s new Clone army, led by their Jedi commanders, attempt to win the war against Count Dooku and the Confederacy of Independent Systems. The latest ‘batch’ of Clone troops have arrived, the galaxy is your battleground, take Command! The Clone Wars are here, and this time, YOU are in control. 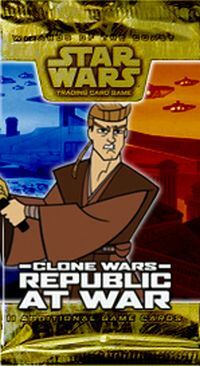 In the fourth expansion created by the Independent Development Committee (IDC), you decide the outcome of the Clone Wars – Republic At War. Expect to see some awesome cards based on the jam packed action from the Cartoon including Jedi, Clones and Droid armies. The Dark side is clouding young Anakin’s judgment. Watch him take his first steps down the dark path or help him in his fall. So pick up your weapon and join your troops on the battlefield as you take control of the galaxies fate. The Clone Wars has begun; finish the fight! 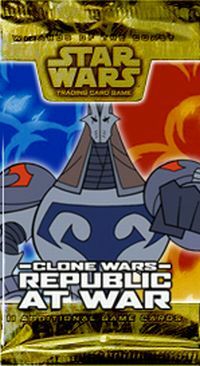 Clone Wars: Republic at War is the fourteenth expansion for the Star Wars TCG and the fourth for the IDC. It features 120 new cards. Dark Jedi, Jedi, Republic and Separatist based units. Ships and weapons prevalent to these units.